Twin Lakes Community | Welcome to the Neighborhood! Twin Lakes Community is a neighborhood where longtime friends are as important as long-term care. Where independence is treasured. And where the transition isn’t about what you give up, but what you’ve gained. It’s all about finding a place where you can expand your horizons, explore your interests and live an intentional life of purpose. It’s all right here. 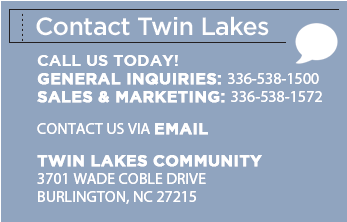 For over 35 years, Twin Lakes has delivered a setting that allows people from across the country to live life the way they see fit, to live a life that matters. Among our many outstanding accolades including five-star rating, CARF accreditation, exceptional financial rating and more. What means the most is our residents’ stamp of approval, their pride, peace of mind, and satisfaction in calling Twin Lakes home. Live, learn and grow at a place where community comes first. Twin Lakes Community. Welcome home.